The drawing above is not new- it was first posted on this blog just a little over a month ago on the night I drew it. As to why it's here again, there is a reason. Story to follow. 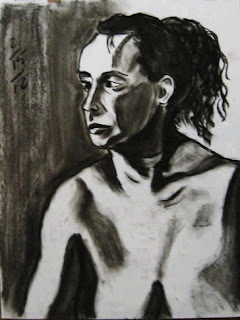 On those rare occasions when there is a 5th Wednesday in a month, the figure group in Belmar that I regularly participate in will usually claim that night for some bonus drawing. Tonight ended up being one of those occasions. However, I wasn't planning to be part of it. Been a busy day, and the next two will be even busier, and with our next regularly scheduled night just a week away, I figured I'd take the night off. Despite that, I decided to drop by the Boatworks shortly before the start of the session. Partly this was to let them know I wouldn't be drawing, but mostly I was hoping to get some photos of the Gimme Shelter show while the space was empty. It was my first chance to see most of the work. Hutch had solved the problem of how to display works made from flat wooden boards by installing some long shelves on two walls, so the panels can rest in a groove and lean against the wall. (people like me who wired their pieces are hung on the wall in a more traditional way) It looks like a few people just stuck some photos to their boards, but most artists put in a lot of effort on their pieces, and some were very interesting. Unfortunately, there were giant yellow post-it notes by everything (probably so they know where the labels will go) so I'll have to wait until the weekend to shoot it. But it turned out that there was another benefit to dropping by the Boatworks. Our group leader mentioned that there had been a request by the BAC to have some of the arts groups that regularly meet there provide a few representative works to hang in the back room while the Gimme Shelter show is up front. I learned that an e-mail had gone out about it today, but I hadn't been on a computer all day to see it. Indeed, a few of our regulars had brought stuff in. I don't have time to frame anything right now, but he said that they would accept things that would be just tacked up to the wall, if I could bring it over the next few days. I went home, figuring to eat dinner and relax for the night, but I realized that the best time to get them something was right then, so I grabbed my most recent figure drawing pad and went back to Belmar. At that point the group was on a break, so I showed a few options to the group leader. He really liked the one above (as did the model, who was standing near by), so that's what I went with. The rain had more or less ended, so I took it outside and gave it a few passes with some spray fixative, then tore it out, trimmed it, signed it, and left it with the others. 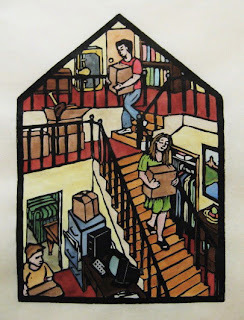 There's no special reception for this back room show, but it will be on display during the run of Gimme Shelter, which has its opening on Saturday March 3rd, from 5 to 8 pm, and runs through March 23rd. Definitely worth checking out. Me, I never stop working on my next woodcut, whether it be cutting, printing, coloring, drawing, or even just thinking about which project will be the next one. However there are certain times in the year when I try to get a lot more people involved in cutting wood, and this is definitely one of them. Up first are my college classes. My 2D classes have been doing woodcuts going back to my grad school teaching days, and this semester I have one at each of my two schools. One is getting to start the project this week, so yesterday I made a stop on my way home from work and picked up a couple of 2' x 4' sheets of plywood. 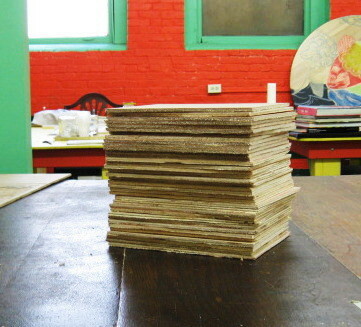 Today I cut up most of it in the Studio, into the standard 8" x 6" blocks that I provide for the 2D students. I prepared enough for both classes, even though my students at the other school won't start for a few more weeks. While I was there today, I took some time to look at the other print supplies that I have in stock. This is because things are moving forward on two local relief print workshops that I'll have going beginning late March. First will be the Creativity by the Sea arts festival in Ocean Grove coming up the weekend of March 23rd -25th. 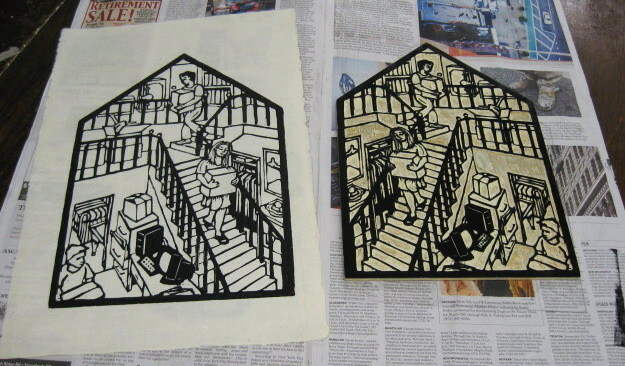 I'll be doing a one day workshop in linocut on Saturday the 24th, right there in the Studio. (interested people should sign up soon- a few spots remain) No wood needed, but I will need ink and paper. The schedule has two other classes offered in our building- landscape painting and ceramics, so we may have a lot of first time visitors wandering around. 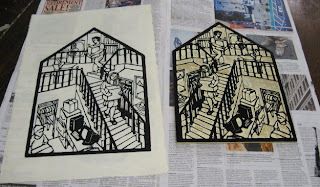 Then just a few days later I am beginning my next round of woodcut classes at the Belmar Arts Council. These will be running on four consecutive Tuesday nights from 7 to 9 pm, beginning on March 27, 2012. Last year's went well for those who participated, so I assume the spring edition will also go well if I can get people to sign up. 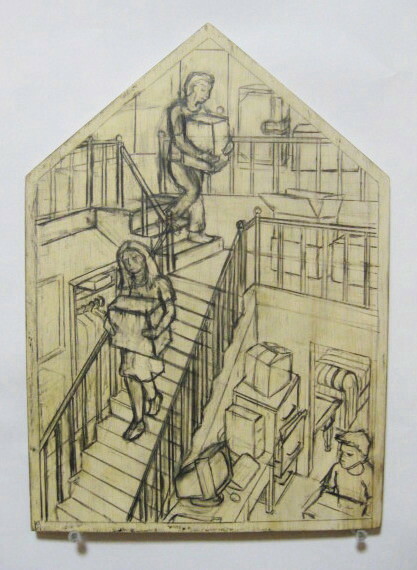 I have a woodcut in the show opening at the Boatworks this weekend- maybe that will help me recruit a few people. I will need wood for the class, but I'll cut it to size as we go, based on what each student wants to do. You can get the information and/or sign up on the BAC website. Over the past few days, I have added colors to the second proof of the house block. 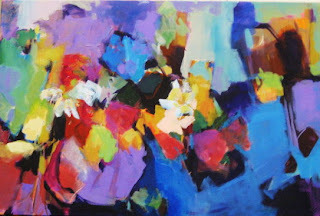 It was a gradual process, owing to both my busy schedule and the need to see how each new color worked before adding another one. I finished it early this morning. The photo above shows the final state. I don't know that this is the absolutely best color scheme, but I think it works well enough and today's 1 pm deadline clinched it. After looking at the minimal margins around the image and the slightly buckled state of the colored paper, I changed my plan and decided to just go ahead and glue it all directly to pine plank. Based on my tests the other day, I knew it would work and look pretty good. But before committing my only good proof, I wanted to test glazing techniques on those test pieces. 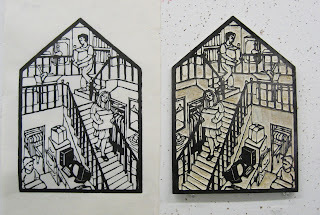 Molly had said that sometimes she used a dilute PVA on top of her wood mounted pieces, but she's working with dried silkscreen ink, while my piece is watercolor that could release from the paper if it gets wet enough. 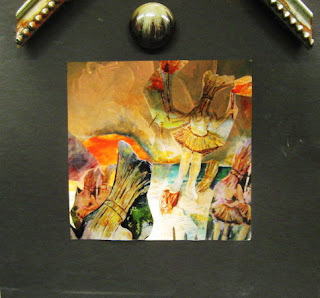 When I tried it on one of my test pieces I found it mostly worked, but a little of a dark color migrated into a lighter area, and with all the detail in the current piece, there was more danger of that. 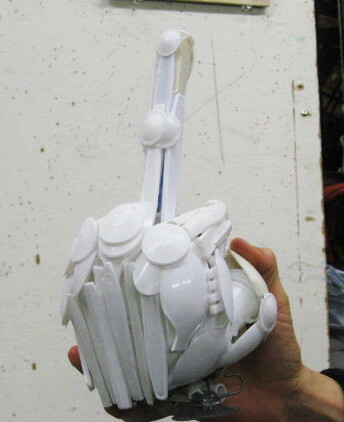 The alternate was a spray coating- sticks where it's sprayed, and not waterbased so it shouldn't cause a problem. I didn't have any handy, so I made a quick run to the store for some. Back at home I started the last phase of this piece. I cut the paper margins down to about a half inch around the actual image, carefully figured out how to center it on my plank surface, and secured it in place. I started at one end and gradually glued the print to the wood, smoothing it down as I went. After it was dry I took it outside to the parking lot behind my building. Small wood screws were inserted into the back in predetermined locations, to provide mounts for the hanging wire. I trimmed the excess paper and smoothed the edge of the wood. I used a spare empty box as an impromptu spray booth, and gave the mounted print several passes with the clear acrylic coating. I left it in the box outside for a few minutes to dry and air out. Calculating that it would be dry to the touch by the time I got to Belmar, I threw it all in the back of my car and drove to the Boatworks. Got there just in time for the deadline. Still a whiff of the solvents from the clear coating, but it was indeed dry enough to handle. Got a very good response to the piece from the people at the intake desk, and from other BAC regulars helping out. This was based purely on the visuals, since I didn't have time to explain the piece to anyone. They had a station set up to photograph all works as they came in, so I used the opportunity to take my own photo of the completed piece. My piece was number 87 on the intake sheet. Two more came in before they closed up for the day. Most were already stacked up in the side room, so I couldn't see all of them, but from what was visible, it's going to be a very diverse show. Artists took the instruction to make use of the board in any way they wanted and ran with it. The show opens with a reception next Saturday, March 3rd, from 5 to 8 pm. Glad to have gotten my piece finished in time for the show, but I'm not done with this print. I'd like to have a copy of the print with the chosen color scheme to show at the next critique group, so I drove from Belmar to the Studio, and got out the now dry block. In the course of coloring the two previous proofs I had noticed a few tiny things that hadn't been cut, so I took care of those. Then I pulled a quick proof, which I hung up to dry. It should be ready to color by midweek, but it can wait until next weekend if necessary. Now that I know the colors, the process will go relatively quickly next time. With the deadline for the Gimme Shelter show coming up fast, I had to make some real progress today. I got up to the Studio in the early afternoon, and started with the wood. I used the house block as a guide to measuring the shape for my pine plank base, marking it so that there would be an even margin on all five sides. Luckily I have a miter saw in the Studio, and after a little experimentation, found that 40 degrees was the right angle to match the proportions of the print image. 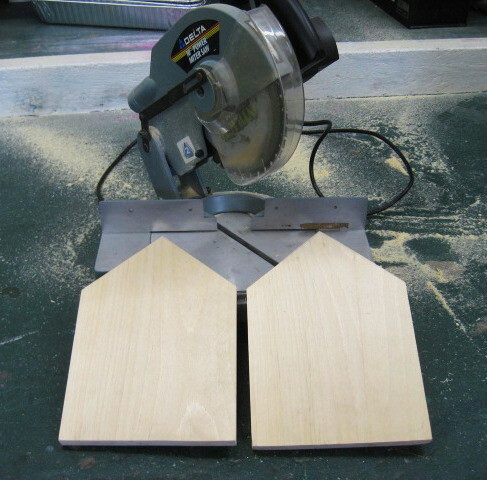 I cut one such shape, taking it right from the end of the plank. Because the wood had a few nicks in it, I decided to make a second piece of wood, using the first to measure it. Did a little touch up with a coping saw, rasp, and sandpaper, and in the end, I had a base and a spare. I set those aside and started my coloring process. I decided to start with the palette suggested by that old Life Magazine photo from yesterday, building with a deep red, pale green, and golden yellow, along with plenty of dark woods. As a combination, the colors were attractive- it's pretty much how the Studio is painted. I then started adding in browns and neutrals, and began experimenting with possible colors for the stairs (see above). I didn't hate it, but I didn't love it either. I had one other idea for colors since yesterday. 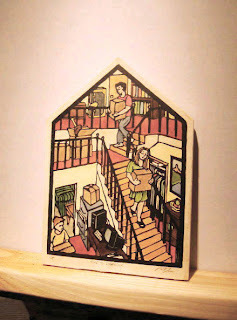 I thought about another color print with a house interior, St Eustace, done a few years ago at my brother's suggestion. I didn't have it in the Studio yesterday, but I dug up a copy this morning and added it to the pile of stuff I brought with me today. It actually has a lot of the same colors, though with different shades and proportions. I made some quick notes of which colors I would likely use in each part of the second proof, when Molly came through for a very quick visit. I showed her the still uncolored proof, which she liked a lot. She quickly mentioned the dark bannisters and railings and what it did for the composition, which is a confirmation of the decision I made before printing. She really liked how the figures fit into the composition, saying that she had been concerned that the scene would become too cluttered. In my head I knew it would work, so I had no concerns over their inclusion, just in getting the poses right. She agreed that the colors on the first proof weren't quite right. She also made a few technical suggestions for my mounting strategy, as it's a variation on what she regularly does with her work. And then she was on her way. 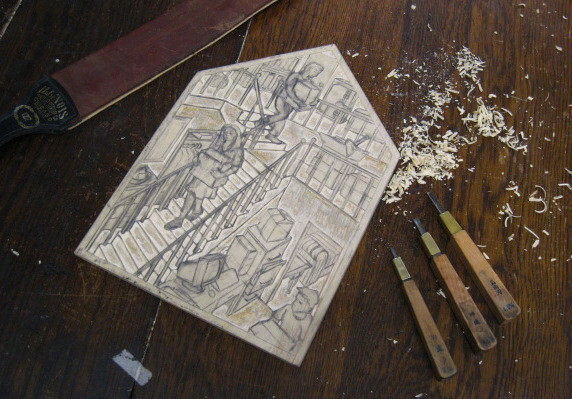 For the second proof I started with the brown color that I had made for the wooden stairs, though it also ended up in a few other spots as well. The yellow walls are a little lighter than ochre color I used yesterday. I took the red off the wall in the lower left and moved it to the carpeting, making it more of an earth red and a little darker. The carpet is much darker now, which will change the value balance in the composition. By then it was close to 5 pm, so I called it a day, the proof in the state shown above. So far I like it better than the first. I brought the proofs and my watercolors home with me, so I can add a few more colors whenever I have a little spare time. For a long time, Thanksgiving has been the number one food holiday in the United States, a meal that can be as traditional or intercultural as you want it to be, as long as the table is full. In recent years it's been noted that SuperBowl Sunday, though not sanctioned by the government, is a de facto holiday and considered number 2 in terms of food consumption- anything that can easily be consumed from the couch while watching tv. For the number 3 holiday in terms of food consumption, I'm going to suggest Mardi Gras. 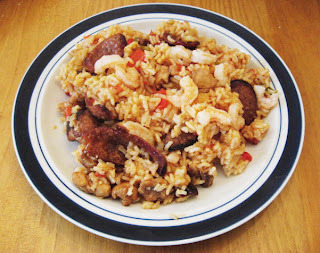 For some people it's more about the music, drinking, and general chaos, but I can't separate Cajun food from the rest of it, and as has been noted here before, Studio Arrabbiata celebrates the hot and spicy of all cultures. 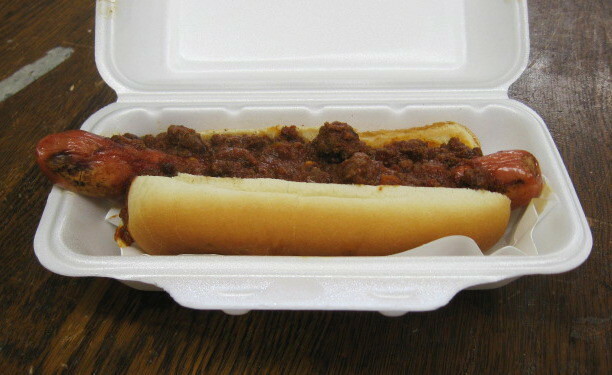 More traditional food was on the menu for later, but up at the Studio in the early afternoon I got things started with a chili dog from the Windmill (above), right across the street. Not super spicy, but good juicy, crunchy, messy pre-Lenten fun. Time for art. 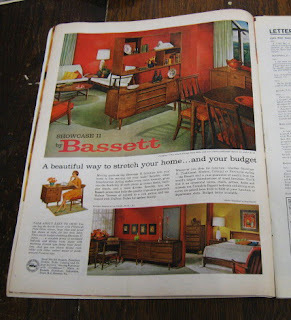 Lacking any preconceived ideas for color in the scene, I went looking for ideas in a favorite source of inspiration- magazine photos from about 50 years ago. I like the idea of the house in this print having been lived in for a long time, perhaps once so full of stuff that the occupants never had the opportunity to repaint the walls or change the carpeting. I brought a few old magazines with me to look through. The page below is one I'm considering as a starting point, especially the photo at the bottom of the page. My main goal today was to continue my experiments with paper and wood. The little prints I pulled a few days ago were dry enough to work with. I cut one into three pieces. 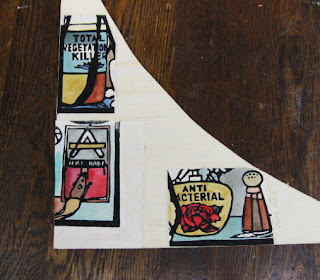 The first piece (anti bacterial soap and salt shaker) was glued down to the wood (one of Molly's birch plywood scraps from her tables) before coloring. The other two pieces were colored with watercolors first, then glued down to the wood. In all three cases I used some pH neutral PVA (white glue), spread very thinly on the wood. The total vegetation killer is glued on the whole back, while the mousetrap is only glued on the paper margin around the printed area. In all three cases, the colors look fine, not affected by the glue in any way. Any of the three would work for a short term solution to mounting the piece, but right now I'm leaning toward the mousetrap option. I can slide a shaped piece of neutral paper behind the house shape, which will probably be a little more archival than gluing the print directly to the wood, which tends to be a little acidic. Plus I can choose the best colored copy to mount. From there I drove around the county, investigating materials that I may need in the coming weeks. At an art supply store I found my favorite brand of watercolors for sale, but more expensive than the catalog price, so I passed. Took notes on paper types and prices for possible use in my planned upcoming workshops in Ocean Grove and Belmar, so not a waste of a trip. Next stop was to get some lumber for my house project. Based on the size of the house print, I figured a wide plank would be the best way to go. Back in the Studio I had made a measuring strip from a piece of paper, marking both the size of the paper and the image itself. Checking that against wood on display, I found that a 1" x 10" plank (which of course is actually about 3/4" x 9" for those who aren't regular woodworkers) would be a good size, leaving a healthy margin on all sides to glue the print down. Took home a 6' section- more than I need, but that was the smallest size, and if I make a mistake cutting it, I have extra to work with. After that, I could finally call it a day. Went home, put on some zydeco music, opened a beer, and enjoyed a nice big portion of my homemade jambalaya. Nice and spicy way to finish this Mardi Gras day. The art will continue tomorrow, but the food will be considerably less plentiful and exciting . I spent quite a bit of time thinking about the presentation of this piece for the upcoming Gimme Shelter show in Belmar. I'm leaning toward presenting the print mounted on a piece of similarly shaped wood- that will allow me to add the intended color, avoid the issues of a five sided artwork in a four sided frame, and give it a similar presence to what most people will submit for the show. The big question is how to get it to stick to the base without damaging the paper or the watercolor paint. I have a few ideas, but I think it would be safest to test a few procedures before committing one of the two proofs that I have available. So with that in mind, I decided to make a few testable pieces. 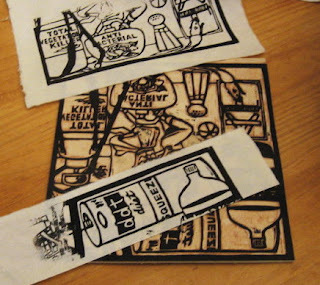 I stopped by the Studio very briefly this afternoon, picking up my traveling printmaking kit (a bag of brayers, wooden spoons, etc), along with an almost empty can of oil based ink, and a few decent sized scraps of the same okawara I printed on yesterday. 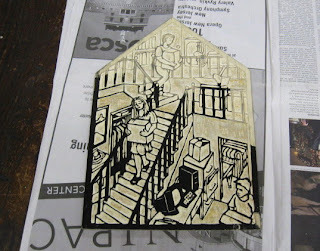 I don't want to re-ink the house block at this point, so I grabbed a block from a few years ago to make my test pieces. The rest of what I needed was already at home. In the evening I took care of the first step. I could have used a glass palette (how I usually roll out my ink for my prints, and for student work as well), but that's one more thing to clean, so I went with an empty cereal box instead. I usually have a lot of them piled up (use them with my classes), the size is good for this purpose, and the coated cardboard exterior will resist the ink long enough for a quick job like this. 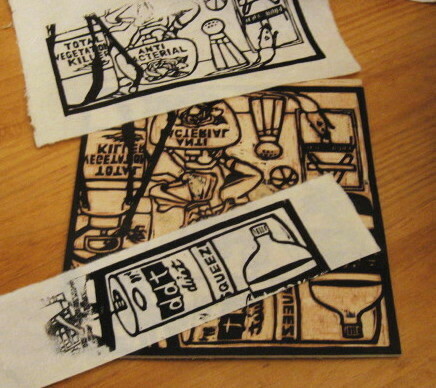 I rolled ink onto a couple of sections of the small block, then printed these sections on two scraps of okawara. 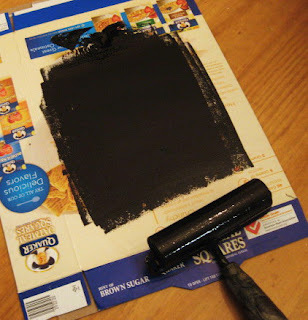 The previous coat of ink on the block from the original printing made the job easy. The pieces of printed paper should be dry enough to color in a few days. (brought home a small bag of watercolors for this purpose) I'll try some of my mounting ideas, and if one works, color the new print and get it ready for this weekend. 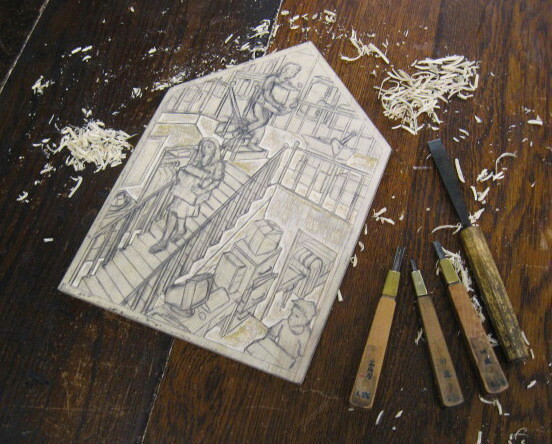 In the early afternoon I drove up to the Studio with the plan of finishing the cutting of the block, and perhaps pulling a proof or two. 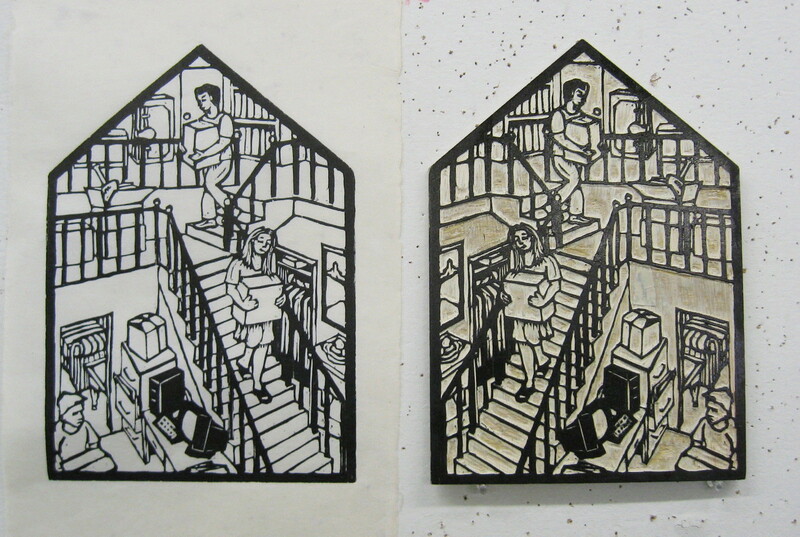 In about an hour and a half I finished cutting the three figures and the rest of the stuff around them. I made the decision to leave the banisters and railings as solid black, instead of completely cutting them out, figuring it would help them stand out better against all the clutter. Since the deadline is coming up quick on this, I decided to keep going and print it. I have a supply of partial sheets of okawara that are a good size for this block, and the thin Japanese paper prints very easily with hand rubbing. The image above shows the ink going on to the block. I pulled two proofs- as usual the second one being a little better than the first. The photo below shows the second proof and the block side by side. I can't do anything for a few days while the ink dries, except think about the next step. I have two options for the upcoming Gimme Shelter exhibition. My original plan was to use the carved block itself as my entry. That's assuming that the ink is dry by next weekend. With that option I would likely not try to add color, but rather just figure out a way to add a hanging wire. The down side is that it ends my involvement with the block, since this show is a fundraiser and the plan is to auction off the pieces in the show. The second option is to color one of the proofs and come up with some way to present it. I could just put it in a frame, though I'm not sure how it will look in a rectangular frame. I have thought about attaching it to a piece of wood of similar shape, giving it a similar presence to the wood itself, which would fit in better with the rest of the work in the show. Like I said, I have a few days to think about it. I got home from work early in the afternoon, grabbed some quick lunch, and drove up to the Studio to continue work on the current block. As I mentioned last time, I planned to finish all the wall and floor surfaces up on the top level, and then take on the stairs. And that's pretty much what happened. I put on a disc of all my favorite songs by the Wipers, and when it was finished, so was I. 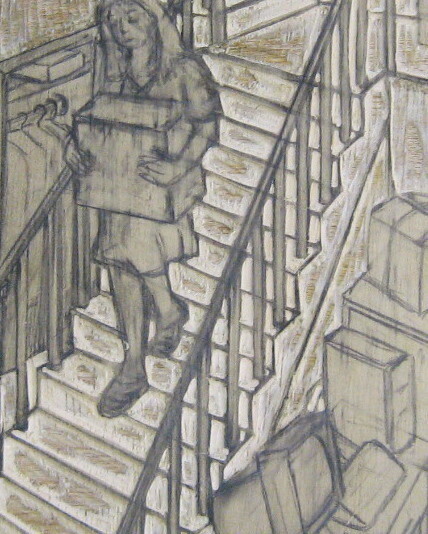 The above image shows the stairs. Redrawing it a few days ago really helped here- otherwise I would have wasted a lot of time trying to figure out what to cut, and likely would have made a few mistakes. Below is an image of the whole block as it looked at the end of the day. Tomorrow I go back in and try to finish everything else- the figures, furniture, and assorted junk. And if there's time, go ahead and pull some prints, since the final piece is due in the show a week from tomorrow. This past Sunday the Boatworks was packed with artists, maybe 3 dozen trying to draw from the models during the Dr. Sketchy event. Tonight things were a little closer to normal. We had a good crowd- nine artists, which is three times what we had at the last Wednesday night figure group. It was a tight squeeze, but I found room for me, my easel and my drawing board. A new model for us, though I understand that she worked last week for the BAC costumed figure group. 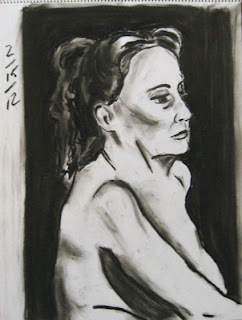 I did two 40 minute drawings. The model was very excited by the first one (top), saying how much she loved how I drew her face. I see things as looking a little crooked. 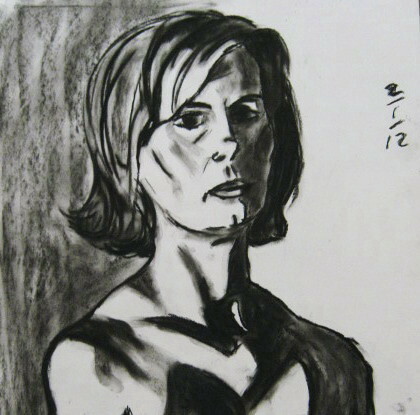 I preferred the second drawing (below). It's not without flaws, but at least things seem like they're lining better. 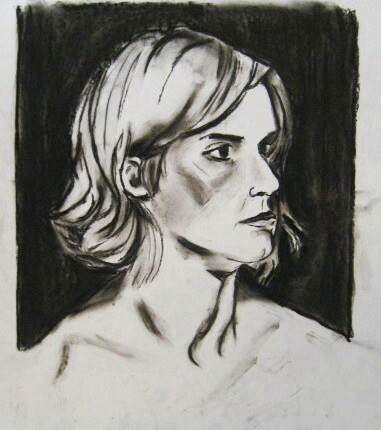 The model did like the way I drew her back on that one- thought I had emphasized her muscles, but I was just drawing what I saw. Began the cutting process on my block this afternoon. With complex scenes like this I often start with all the negative spaces, saving the figures and objects for later in the process. That's what I did today. I cut all the walls and floor spaces on the lower and middle level, which is a significant portion of the image. Next time I'll do the same for the top floor, then take on the stairs. The block turns out to have a few slightly soft spots, where the wood tends to tear rather than cut, despite having sharpened my tools today. But mostly it's going as expected. Was up at the Studio for a few hours this afternoon, continuing work on the current block. At first glance not much has changed. I did add a few things- a set of drawers on the lower level (bottom left), some sports equipment sticking out of a box on the middle level landing (middle right), and a bookcase on the top level (upper left). I spent just as much time making slight adjustments to things drawn previously. 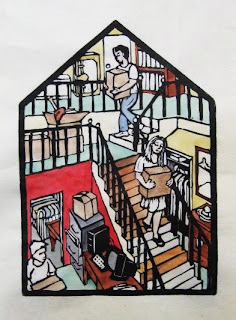 That includes all three figures, but mostly it was cleaning up and redrawing the banisters and railings. 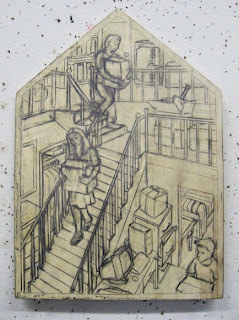 It's all a lot clearer now in the drawing, which will make it much easier to figure out when I start cutting. After the addition of just a little more clutter, that cutting should begin tomorrow. Usually Wednesday night is figure drawing night around Belmar, and for me that's most often with charcoal on large paper. 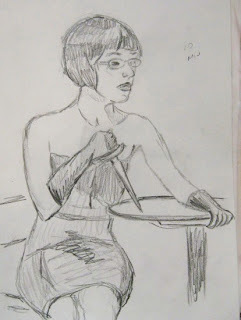 However the BAC was hosting a special event tonight, something called Dr. Sketchy. It's based out of Asbury, putting together models and themed costumes, plus music and prizes. The theme for today was "Soviet Takeover", so in addition to some industrial looking foundation garments, the models at times wore various bits of military apparel, and brandished prop weapons, all against a background of Russian/Soviet flags. (this being the 21st century, they also had more tattoos than one would associate with women of the cold war era) It was mostly short poses, 5 to 10 minutes, and extremely crowded- at least 30 artists squeezed into the back room of the Boatworks. We had both models for the last couple of poses, each about 20 minutes. The drawing itself was fun, but I wasn't crazy about it being so crowded (hard to get good sight lines for some poses, and I only had enough space for my sketchbook), and at times there was way too much noisy talking from people on the side who weren't drawing. The 20 minute drawing above has some proportional issues, but it was my best of the night. Photos of the session itself can be seen over on the BAC blog. I didn't see any point in filling in more stuff for the house until I got some figures in place. My plan was to show two figures carrying boxes down the stairs (up would imply moving more stuff in), and at least one on the ground floor. The problem was in figuring out how to draw them- the movement of bodies walking down stairs, as well as being shown from different angles, not something I've had to regularly deal with. The one at the top is actually nearly at eye level, so it was the easiest to work out- I just noted my own movements walking down a step, and picked a version to start with. The middle one (seen from slightly above) would be harder to figure out on my own, so I looked for a reference. Eventually I found a few on the internet, and combined aspects into one figure and put her into place. For one at the bottom I needed to be looking down on the figure. I thought of a favorite comic book series that had a lot of scenes of characters seen from far above and below, found something close to what I had in mind, and modified it for the space and pose I needed. These are all just roughed in and will need significant adjustments, but I like the way they fit into the space. I'll fix them up, fill in a last few piles of junk, and hopefully get it cut by the middle of next week. That should keep me on schedule to print it in time for the show. Ten of our regulars convened in the Studio for the monthly critique group. One remarked that it seemed like we had just been here. Not really- although we delayed last month's a week, we had five Mondays in January, so it's been the usual 4 weeks since the last one. We're all busy artists, so almost everyone had something new to show. Above is our opening group shot of most of the work. 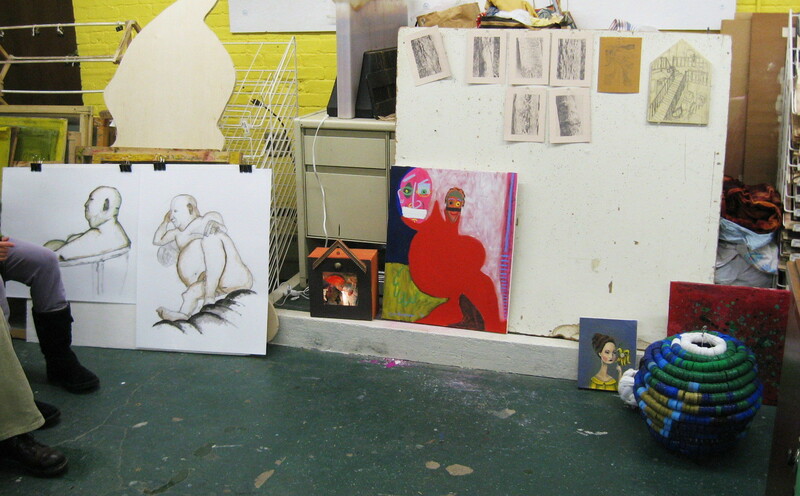 From left to right (bottom row), figure drawings from Vince, Harriet's light box construction, Tim's abstract figure painting, Katie's small portrait painting, TJ's abstract painting, and Lisa's plastic constructions, (top row) graphite drawings from Jane, and my house shaped block. Some detail images- (above) the interior of Harriet's light box construction (below) Lisa's bobble middle finger- a potential dashboard accessory. Sandy arrived a little late, but brought us the very colorful abstract painting seen above. 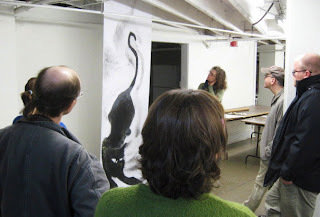 We finished out by the cafeteria, looking at Molly's large cat rubbing, back from its recent show in Asbury Park. Several of us had seen it there, but this was a good opportunity to actually discuss it and her future plans for the piece. When it was my turn I explained the idea behind my house project. 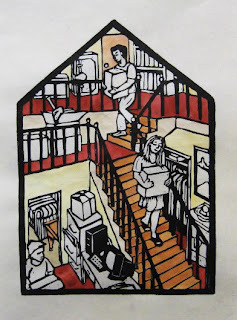 Last time I had told the group about my plans to do it, but hadn't yet come up with my house too full of stuff concept. The group liked it. Molly liked the skewed perspective and the edge that it gives the piece, which is something I wanted. In general people liked my theme and agreed that the relatively open space worked better than my original dollhouse style composition would have. The only other suggestion that I remember was to give any potential figures very large loads to carry. We'll see. Small crowd for the drawing group tonight, so plenty of options as to where to set up in the room. Our coordinator requested a more upright pose than we usually see, which ended up being our model sitting up on a stool, which was on top of our model stand. As a result, her head was well above eye level, especially once I sat down to draw. (in these sessions, I favor using my folding box easel as angled table and sitting at it, my drawing board flat on the table) Two things came from this combination. One is that I saw her a little more from below than usual, so seeing a little more of the undersides of her chin and nose in my view, which can be awkward to draw. 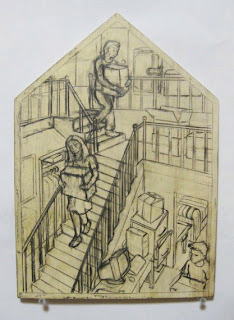 The second is that she could get a good view of my drawing in progress, albeit upside down from her point of view. From where she was sitting, she liked the 45 minute drawing shown above the best. She still liked it when I showed it to her the right way.